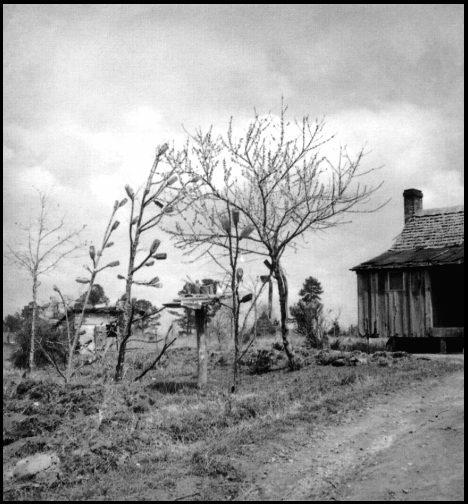 This photograph by Welty, of a home in Simpson County, reflects a folk belief that "bottle-trees"  trees on whose limbs bottles have been placed  will trap evil spirits that might try to get in the house. Welty used bottle trees in her short story "Livvie," which was set near the Old Natchez Trace, a famous colonial "road" used by Indians, merchants, soldiers, and outlaws between Natchez and Nashville, Tennessee. This photograph, like many others taken by Welty during her work for the Works Progress Administration in the 1930s, appears in One Time, One Place: Mississippi in the Depression: A Snapshot Album (Jackson: University Press of Mississippi, 1996). This page has been accessed 2456 times. About this page counter.